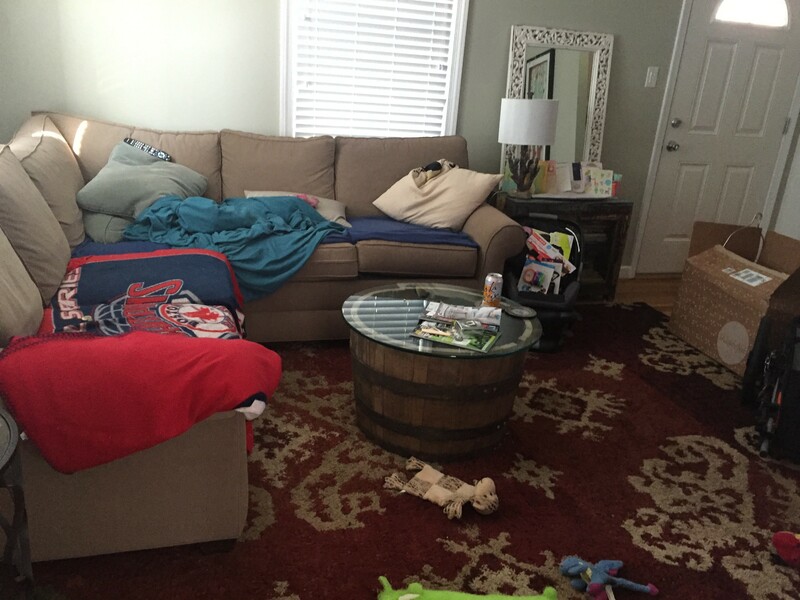 Nesting: My favorite Pregnancy Symptom! This couldn’t be more true. I purge on a regular basis, constantly cleaning out, replacing the old with the new. But during this pregnancy, it was on a much deeper level. I let go of things that I had been holding on to for a while. Then my husband and I finally completed the mandatory home projects that we kept making excuses about and putting off. I have written about our 1945 duplex before, and if you can recall, I have revealed in the past that this 1945 duplex, although charming, is a small place. Because of the size, I have always tried to live as minimalist as possible. However, living minimalist is quite the challenge – over the years things got cluttered. Getting rid of old stuff was crucial to make room for the baby’s essentials. As I got rid of old stuff, and washed away dirt and dust, a weight was lifted. When I replaced the old with the new, the once stale energy shifted to a fresh, light, positive vibe. Even little changes can make a huge difference. The idea to- “Hold off on large-scale changes to your home,” is suggested in the book The Kindmama. But what exactly defines a large scale project. You may consider some of the projects I completed, on the large scale size, but I stayed stress free. And completing these projects brought my husband and I both happiness and comfort. So in conclusion, I recommend that you determine the stress level of the project and ask your pregnant self… once this project is completed will I feel more content. Your home is your sanctuary. It needs to be a place that expresses your identity. It needs to be a space you can enjoy, and feel completely comfortable and relaxed in, especially when bringing a newborn home. Because of this idea, we decided to just do it all. In late March, my husband and I researched different types of windows. Once we determined what would be best for our house, we scheduled for them to be replaced. This wasn’t a cheap project, but it is worth it in the long run, and will cut costs on our bills. Because of how old our house is, it was also checked for lead – thank goodness it is lead free. We don’t want a toxic chemicals like that around our new baby. We had cheap, old, dusty blinds, that were there when we bought the house. My min pin loved to stick his nose in between the blinds and bark at neighbors while they walked by. Replacing the blinds was a must. I couldn’t have a barking dog, and crying baby. We now have beautiful white wooden blinds on the first floor, and shades in the bedrooms. The Min Pin can’t look out and bark anymore, and the windows look complete. Window treatments can make or break a room. It is a very little change, that has made a huge difference. We replaced the old fence with a new one. This project was definitely a necessity. Our old fence was a very run down chain linked fence that actually never completely closed, (again there before we bought the house.) We have two small dogs, and because the fence never closed, we always have to supervise the dogs while they are in the yard. Now that the new fence is up, we are able to let the dogs enjoy the yard by themselves, which will help when the baby comes. Plus, the fence looks awesome! In the future we may paint it white, but for the time being we’ll see how the wood ages. When we moved in, we loved the kitchen/dining room wall color. But the rest of the colors in the house had to go. I painted the living room, but never got to the bedrooms. Both bedrooms were a very ugly mauve color. They were definitely in need of a fresh new coat of paint. 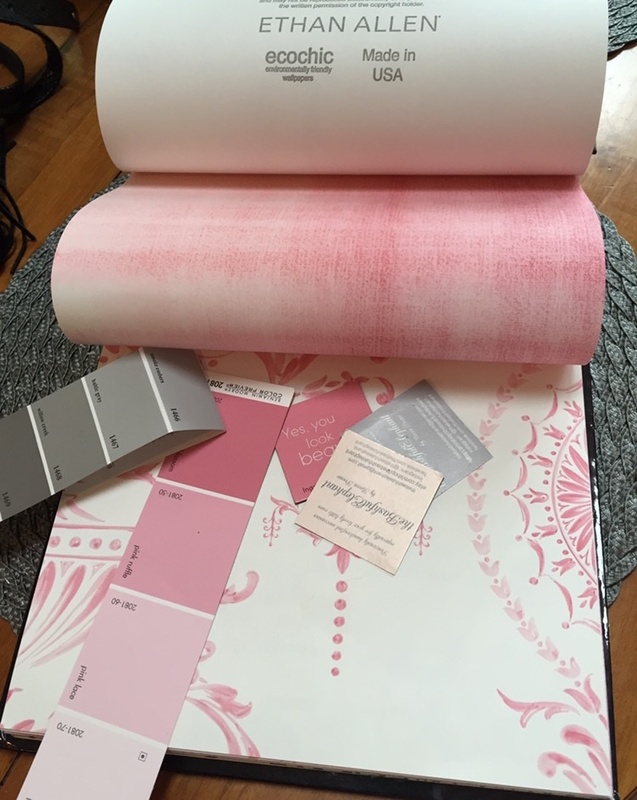 We painted our bedroom a Benjamin Moore color called African Violet, it is a gray lavender. This color couldn’t be more perfect. It goes great with our dark framed bed, and the amethyst knobs we have on our white dresser. Then we painted our guest room, now baby’s room. The color is also a Benjamin Moore color, called Baltic Gray. Gray walls, white furniture, and accents of pink, makes this baby nursery elegant but sweet. Perfect for a baby girl! I’m going to give you a sneak peek of the nursery, and write a detailed post a little later. After our baby shower, I went through everything, and figured out what else we needed. Then I organized everything and found a proper home for each item. I replaced the old living room rug with a fresh new one. Besides the baby’s room, I am probably most proud of this. Because I have dogs, I don’t invest in really expensive rugs. Plus, I like fun patterned rugs, that in time, I may get sick of. These are the reasons that I don’t feel bad about throwing out my old rug, when I get bored of it. Although, finding the new rug was a major hunt. My old rug was three years old, but very run down. There is no way I could put my beautiful baby on it for tummy time. It had to go! Note: Below is a photo of the old rug. Take a look at how the rug influences the color in the sectional and wall color. 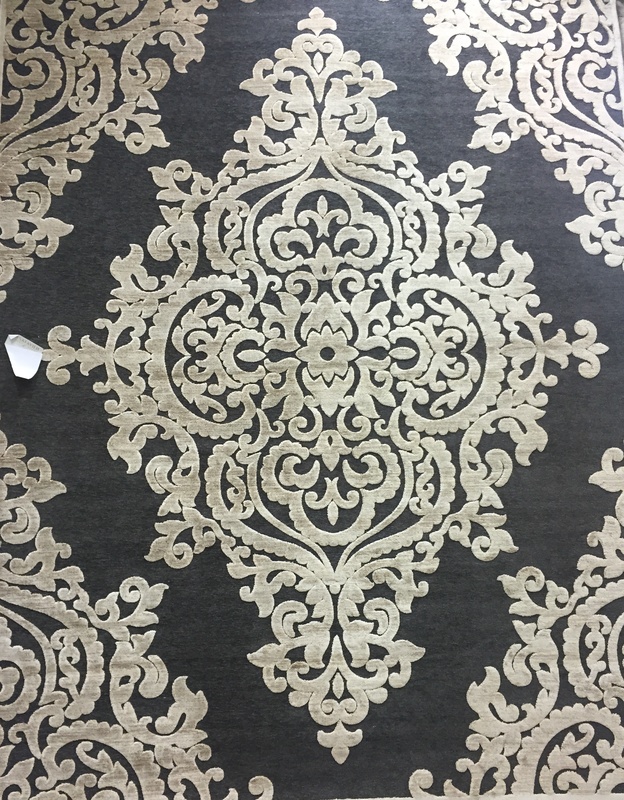 It took several months to find the right rug, but I finally did… WOW… it transformed the whole room! The room looks bigger! The wall color looks totally different. And it not only goes great with all of the rustic details that are through out my house, but it is clean and soft enough for the baby to enjoy tummy time on. My husband is picky about art work. He wants to support local artists or some how have the art connected to us personally in some way. Well my mom had a photo from our wedding printed on a huge canvas. The canvas is amazing! 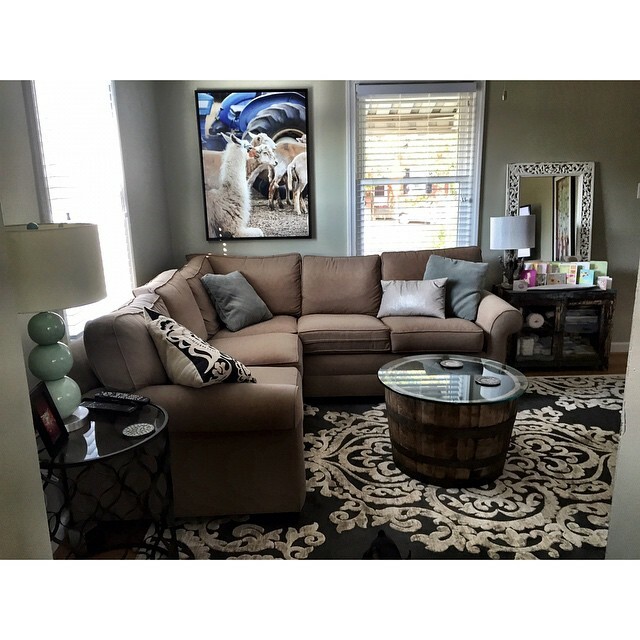 It again brings out the wall color, looks great with the rug, and has a rustic vibe. Nesting has become my favorite pregnancy symptom because things that needed to get done, finally did. It is crazy how even the smallest changes make a huge difference. It feels so good to purge the old and replace with new. Because it is human nature to grow and evolve, so should your living space. Everything is clean and fresh, and we are ready for our baby’s arrival. Can’t wait to meet her! This post is dedicated to my husband. Although, I was the pregnant one in need of nesting, I want to thank my husband for all the hard work he did! He is amazing, and worked hard to make our home exactly what we desired. Erik, Thank you, I love you to the moon and back! Did you have the urge to nest when you were pregnant? What home projects have you accomplished lately? Yesterday, Today, and Tomorrow are rest days in the Livefit trainer. Yesterday, was a perfect day for me to have a rest day, because it was Tuesday. Tuesday always ends up being really busy for me, because I have my art class in the morning, and then I head straight to work. But because of that, I wasn’t able to prepare any meals for the day. I did the best I could under the circumstances, but there were times when I felt hungry, and I don’t think I got enough calories. Remember, I am suppose to be eating immediately when I wake up, and then in three hour intervals. I also did not have a protein shake- this was a major fail. On rest days, I am not working out, and should have more time to focus on nutrition. So Today, Wednesday – 1/30/13, is another rest day! Have I mentioned how sore I am? Today, I was going to go for a short run because a warm front came through and it is 65 degrees out. However, it is also overcast and looks like rain. This was a really hard decision for me, but I actually decided to skip the run and stick to the plan, of “NO CARDIO” in Phase 1. So instead I used this time to prepare my meals for the day. I have noticed eating small clean meals on regular intervals have really given me tons of energy. I haven’t felt tired, or had headaches, but instead super energized. I also have noticed that when before I wasn’t a morning eater and didn’t begin having an appetite until the afternoon, I now wake up, hungry. Below are some examples of the clean foods I ate today. For breakfast, instead of having my normal, hard boiled eggs and greek yogurt with homemade granola, I saved those for later, and had toast with almond butter. I used Ezekiel bread as my toast. I have been wanting to get my hands on Ezekiel bread for some time now, but could never find it. I finally found it in the freezer section at MOM’s. J and I split a loaf because I don’t eat that much bread and didn’t want to have a whole loaf and let half go bad. Anyway, this bread is all natural, organic. It’s ingredients are inspired by the biblical passage Ezekiel 4:9, hence its name. This bread is high in fiber and protein, while being totally flourless. Later in the day, I ate an arrangement of organic veggies with organic hummus. Have you ever had hummus with cilantro in it? This is my new favorite! I also prepared a protein shake with Vega protein. I juiced kale, celery, and pineapple. I poured the juice over the protein powder and added some coconut water. Really yummy drink. Anyway, those are just some examples of some things I munched on today. I am hoping these clean meals inspire you, and give you new ideas of things to pack for your day. Do you eat on regular intervals? Have you ever made your own hummus? What is your favorite “clean eating” meal? My last post focussed on the idea that setting a New Years Resolution is unnecessary for me because it is in my nature to strive to be the best I can be. Because of this, I set goals for myself in most aspects of my life, sometimes not even realizing I do. And when those goals are met, I set new ones. Always challenging myself. However, ever since I was a little girl, I have always set a New Years Resolution so although, it is not necessary, I will continue the tradition for fun, and set one for this year. In 2011, I was in a rut. I use to speed through the grocery store throwing the same items in my cart every time. And most days, it was just faster and easier ordering the same take out everyday. Although fast and easy, I was getting really bored, plus take out definitely was not the healthiest option. So I decided my New Years Resolution for 2012 was to try one new exotic food a week. This New Years Resolution was not only really fun, but it was more specific then saying, I was going to eat healthier- making it easier to follow. This New Years Resolution made me leave my comfort zone, as I started to explore Whole Foods, MOM’s Organic Market, and local farmer’s markets, on a constant quest for a new unique flavor. After purchasing these new exotic flavors, I realized I did not have a clue to how to prepare them, so this New Years Resolution also made me seek knowledge, which led me to new blogs, and later creating this blog. It also led me to the kitchen, forcing me to cook, later discovering a new passion. So as you can see, one small change/goal/challenge can lead to an array of others. This year, 2013, I want to continue on with my last years resolution of trying unique food, and cooking new recipes- mostly plant based and organic. I can’t give that up, it is now a part of me. What use to be uncomfortable, has now become my comfort. However, with that being said, my New Years Resolution for 2013 is to get my kitchen perfectly organized, in a way that will better suit my way of cooking. The kitchen is one of the most important spaces in a home. Trust me, a bad kitchen can make you struggle as a cook – it being to small, no storage, no dishwasher. A very bad kitchen can make you never ever want to cook- appliances being old and out of date. A really really bad kitchen can make you never want to store food or eat there ever- small, no storage, no dishwasher, appliances super old, unusable. I have lived in places that have had really really old bad kitchens. In May of 2012, our dream came true. My boyfriend and I moved into our very own home, after two years of searching. (It was totally worth the wait.) But we are in the city, and being in a city means places are tiny. So although, the kitchen is my favorite space in our new home, it still is a bit small. This year I want to organize my tiny kitchen so it maximizes the space. I want to find new ways of storage and displaying things, but still keeping it minimal. These are stainless steel magnetic spice holders. I love them. I have them stuck on the side of my fridge. They have holes on the side – smaller side to sprinkle, larger side to get a good amount of spice out. I don’t have much cabinet space, so this frees up a shelf that would have been taken up with spices. Before I use to hate digging in the cabinet to find a spice. Sometimes I would think I had a spice and then I didn’t. Other times I would not see a spice and I would but two of the same. With these spice holders stuck to the side of my fridge I can see what I have, and what I don’t. I also can easily reach for a spice whenever I need it. I picked these up at Bed Bath and Beyond. These are my favorite. I found these at Anthropologie. I first got the bigger size ones, that hold pasta, but I ran back and got these smaller ones as well. The size of these are 8 oz. They are a significant amount larger than the magnetic spice holders. I decided to store some of my favorite go to ingredients in these containers. All of these ingredients are raw, natural, organic. They are full of antioxidants, and I usually use them in my my morning smoothies, oat meal, or muesli. I am glad they are close at hand. My favorite part of these containers are the chalk boards. I also love the fact that you don’t have to commit to one ingredient being in one jar. When you are done with the ingredient and the jar is empty, you can easily erase the name on the chalk board, rinse out the jar, and replace it with something else. In this photo, I wanted to point out two things – my magnetic knife strip and my utensil holder. Once again hanging your knives is a brilliant idea because they are easily accessible and they free up a drawer. Also try to invest in a good set of knives. Good knives make prep work fast and easy. As for my utensil holder, it is one of my favorite things in my kitchen. The pottery is hand made, by an artist that sells his work at Eastern Market. My Aunt Kathy, when she came to visit, bought it for me as a house warming present. I think it is beautiful and does a great job holding all of my kitchen utensils. Again it is nice to have everything accessible. All of my wooden spoons are right there at reach, whenever I need them. Just as it is good to invest in a good set of knives, you should also invest in a good set of wooden spoons. These spoons are carved from olive wood from Italy, that I hand wash only. My sister J, bought this tea kettle for me as one of my Christmas presents! It is by far one of my favorite things I got for Christmas! I rarely microwave anything. I boil water for hot tea. I boil water for oat meal. I am always boiling water. So instead of wasting a pot, I leave this on my stove, and only use it for water. I will never forget my water is boiling because it whistles when it is ready. My favorite thing about this tea kettle is the color. Turquoise is my favorite color, and the accent color for the rest of my house. She found this piece at World Market! This is my pot holder! I highly recommend you hang your pots and pans. Again this makes your pots and pans accessible, and you are freeing up a drawer or cabinet. So this is a photo of my kitchen! The pots and pans are hanging on the other side next to the fridge. There are still some things I need to work through, but I think this is a really good start. Because I have been enjoying my kitchen, cooking has become enjoyable. I actually have been cooking up a storm, and I have four new recipes to tell you about, a new spice to tell you to try… so keep your eyes open, I will be posting those in the next couple of days. So that sums up my New Years Resolution for 2013… which I am only setting not because it is necessary, but because it is tradition and fun! What is your New Years Resolution for 2013? What is your favorite space in your home? Do you have any fun storage ideas for your kitchen?